Knitters, crocheters, spinners, crafters: I need your help. I know someone writing knitting chart software. I am watching it as it develops and let me tell you, it’s got it all. I am very excited to see it finished. The problem is that we need a name. We’re stumped. So here’s the competition! Leave a suggestion in the comments before the end of the Ravelympics and if someone comes up with one that we use, they get a free copy of the software. Exciting stuff! (Ravelympics end Sunday so I’m going to say until midnight Sunday 28th). I have been amusing myself with other projects that have no particular deadline. This is mostly related to the increased frequency of snowfalls we’ve been having here this week. 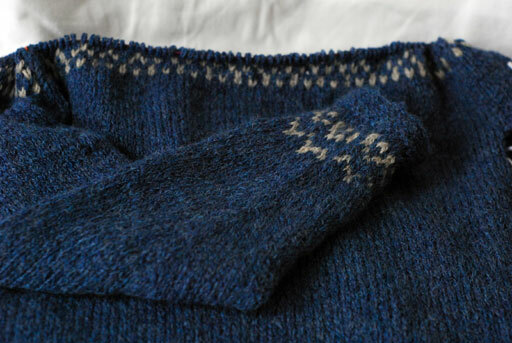 I’ve been cranking out the Stilwell and am about a third through the yoke. This maneuver can only be attempted when both sleeves are knit. Not my forte but at least they’re out of the way now and when I finish the yoke, I will also have a finished sweater! 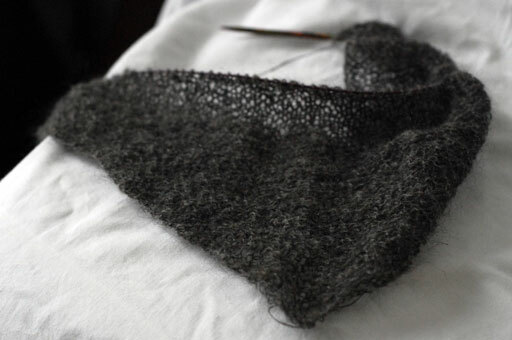 The chart is not the easiest to follow so I gave in and started a shawl that’s been on my mind for a while now. It’s an Elizabeth Zimmermann pattern called Stonington and is modelled on the Shetland square shawl. Really, I just wanted a square shawl. I find triangular shawls pretty limiting in how you can wear them. At least with a square you can have a triangle if you want one but you’re not tied to it. I have about 500m of handspun mohair laceweight that I received as a present many moons ago. 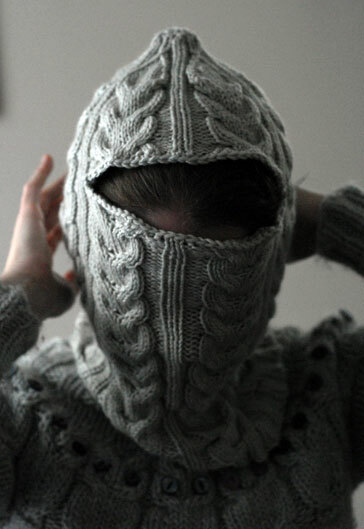 I haven’t had the heart to knit it up but I think that this simple pattern should do it justice. 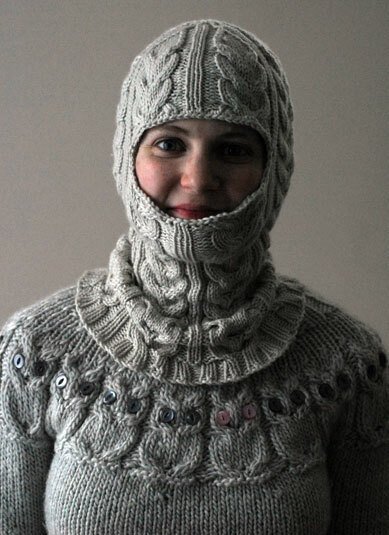 This kind of doesn’t count as an FO in my book (even though it is) because it knit up really quickly. We stuck on Barfly and it was finished by the end of the movie. Anyway, I was just excited to see how my handspun knit up. 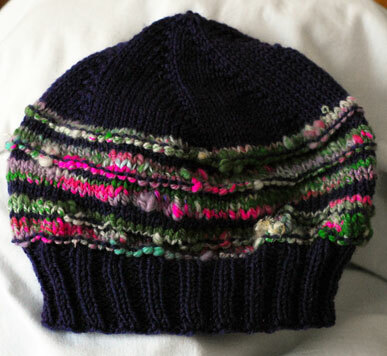 Pattern: Basic top down beanie from Knitting from the Top (Barbara Walker). Needles: 4.5mm all the way. Yarn: This and some left over Brown Sheep Nature Spun worsted from this. The bumpy bits you see are actually not the cause of the handspun alone – I threw in some purled rounds to show up the texture of the yarn a bit better. 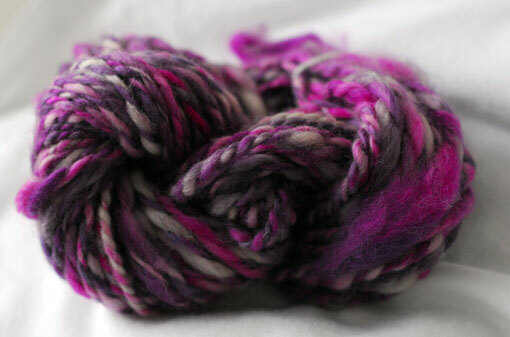 I will be really interested to see how the other yarn I spun (the pink/purple stuff) will knit up in comparison to this. Oh and hey! In case anyone has the Monday blues out there, remember there’s knitting at the Tea Garden from 630 this Friday and there’s a spin-in on the balcony of the Powerscourt Centre on Sunday afternoon from about lunchtime. This double-whammy will definitely be helping me get through my week! 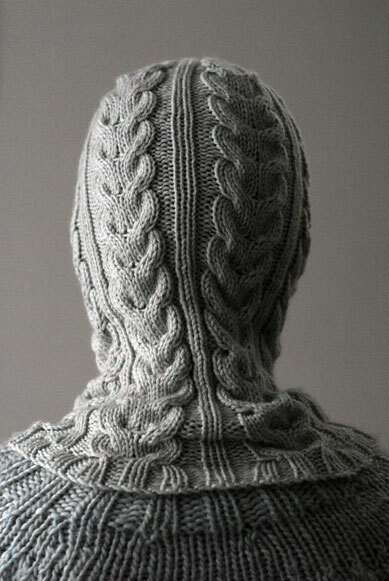 Pattern: From Russia with Love via Craftzine. Yarn: Debbie Bliss Cashmerino Aran, 3 balls (almost exactly – I had about 5m left over). Needles: 4.5mm 40cm circular and a 4mm crochet hook for the opening. So. This Flying Camel event. It seems to have started something quite unstoppable. 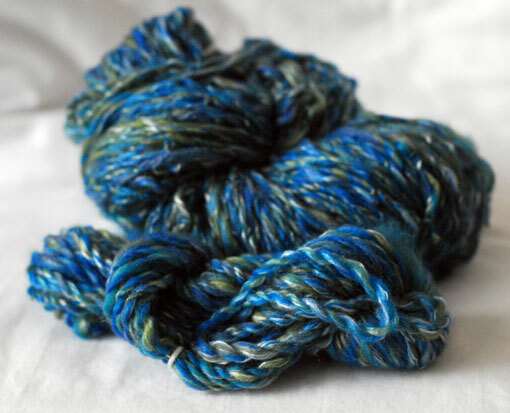 This is the first of my Ashford merino-silk batches. 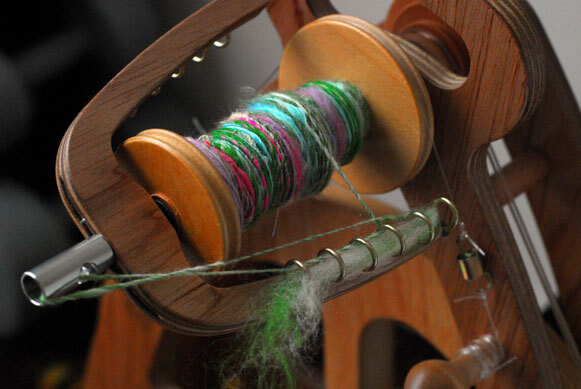 Remember how I was telling you that I spun the second bobbin in contrary motion to the first? And how I only realised when I was plying them together? This is what I ended up with. The really small skein at the front there seems to have responded well to being washed and stretched out. The other skein was maybe a bit too big; some parts in the middle seems to have been unaffected. I am considering re-washing and re-skeining it to see if it can be redeemed. Kind of a rookie mistake, though, that I was determined to avoid with the next batch! Now this stuff turned out well. It’s a fairly consistent 2-ply double knit. To be honest, it really didn’t look very good but when I washed it, it fluffed out and settled nicely. I have about 100g of this. 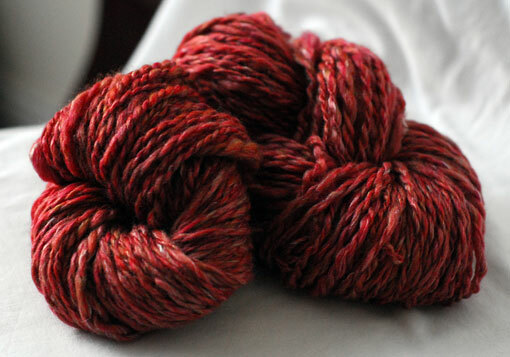 For both batches, I spun them worsted-style with a forward short-draw (well, I think I did!). And do you remember the batt I showed you mid-spin? Since it was only a 40g batt, I only filled half a bobbin. I figured I should challenge myself to learn something new so instead of andean-plying it back on itself as I would normally do, I decided to chain or navajo ply it. It’s a little funny but it works really well, even though I ended up over-twisting some parts. I don’t mind too much though, it was just for a bit of fun. I got a massive kick out of spinning this, as little as there is in it. It was my first time spinning from the fold and using a long backwards draw. There will definitely be more mixed batts in my future! This one was called Clara and (I found the wee composition tag under my mountain of handspun…) it’s made up of merino, bluefaced leicester, angelina, tencel and bamboo. Mmmm. When I ordered that batt from Laura, I also got two plaits of roving with this in mind. Altogether I had 240g of bluefaced leicester. It’s the first time I have ever spun alot of something with a sweater in mind and I figured it would take me ages. In fact, it only took me a few days. The biggest drawback was that, when I was plying, my bobbins kept filling up very quickly. This also explains why my skeins are pretty small! 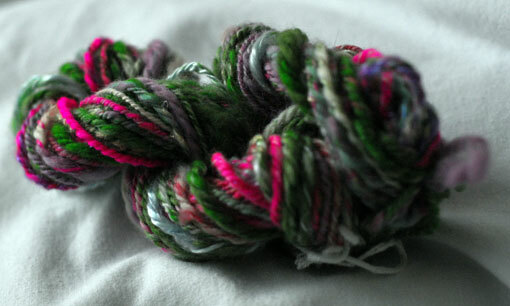 This is the first batch that I spun, plied and washed. The second batch – three more skeins – is on the line. Like the Ashford stuff, I spun it using a short forwards draw. I ought to have enough for the sweater but I’m keeping my fingers crossed! My problem now is that… I don’t have any more fibre to spin. I found a wee ball of roving that I bought in Chicago two years ago and have gotten a bobbin of lace weight out of it that I am going to have to ply back on itself. I am trying to eke it out, though, and frankly am feeling a bit bereft at the thought of no spinning next week. 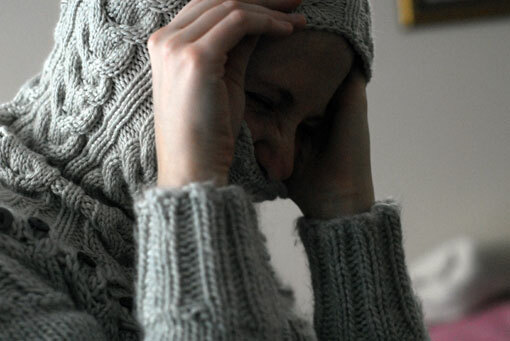 Of course, I am drowning in handspun… it never rains but it pours!